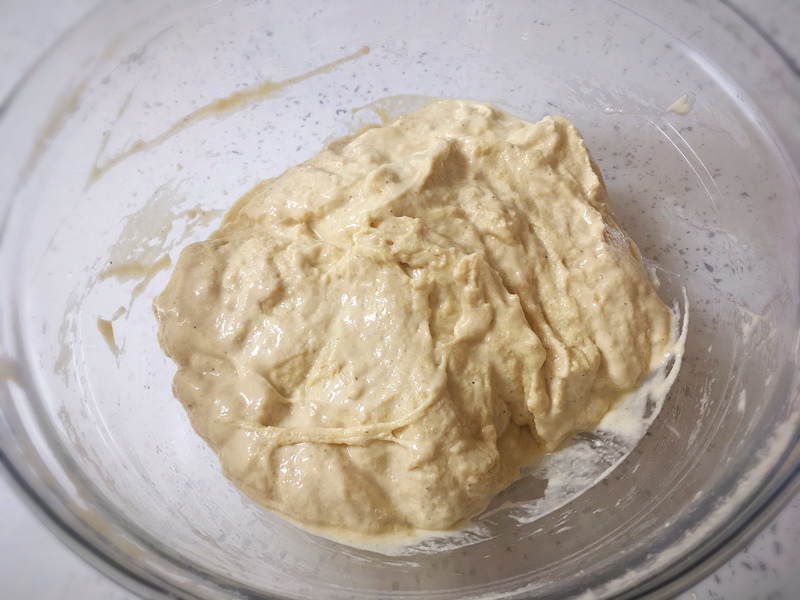 When making sourdough bread, a good sourdough starter is essential to get your bread to rise as it should, regardless of the flour combination or recipe you’re using. I tried for a long time, unsuccessfully, to get my own starter nice and robust but it just wouldn’t cooperate. Finally I decided to buy some of Elaine’s starter, Star, and what a difference it made! She dehydrates her Star at the peak of its strength. 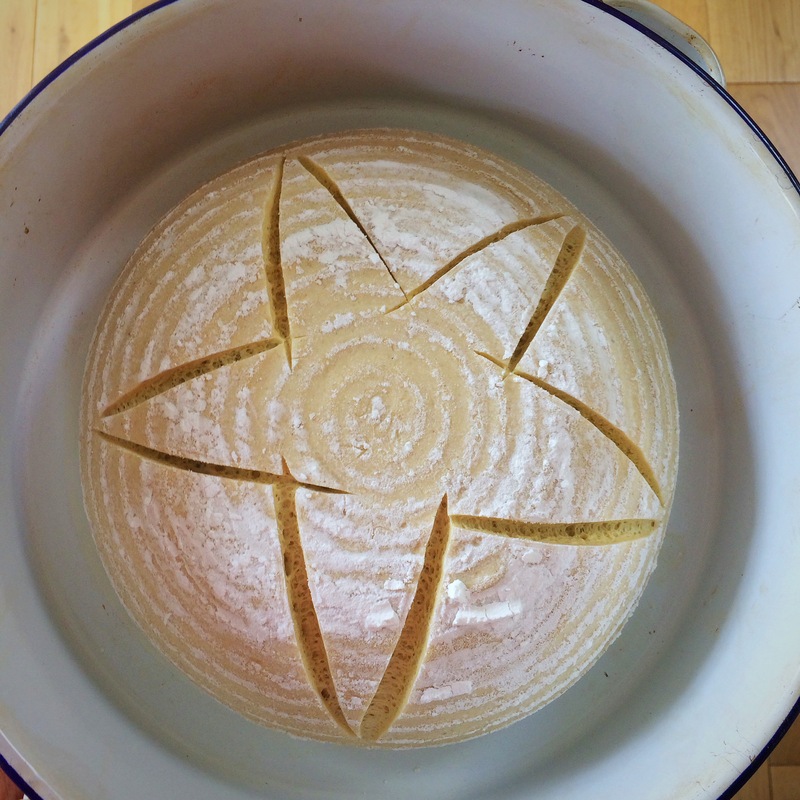 Star comes from a long line of Elaine’s starters that have been performing consistently well for many years, and that was evident from the very first loaf I baked. When I received my packet of dried starter all I needed to do was to rehydrate it and it was ready to bake with. 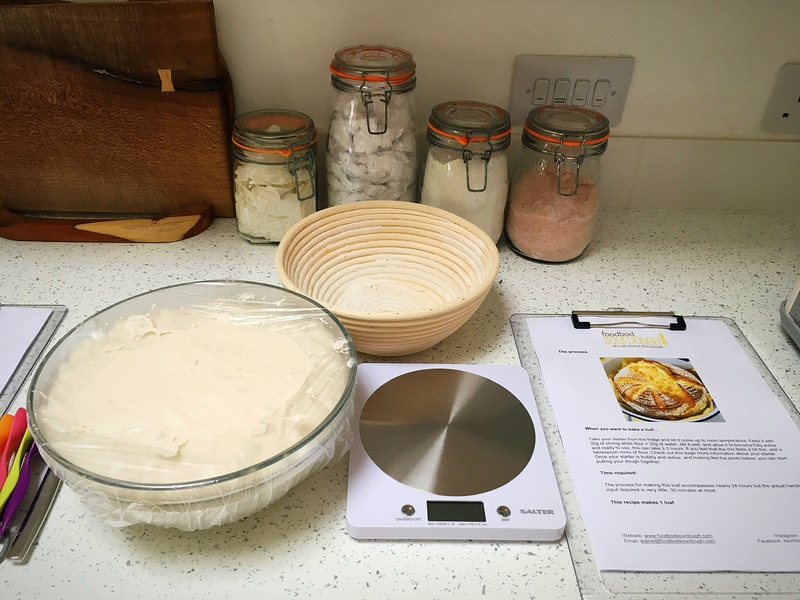 Elaine provides simple and clear instructions, and in a little over a day I had a fully active starter I could either bake with then or store in the fridge to use later. I just can’t say enough about how much more fun baking has become for me now! 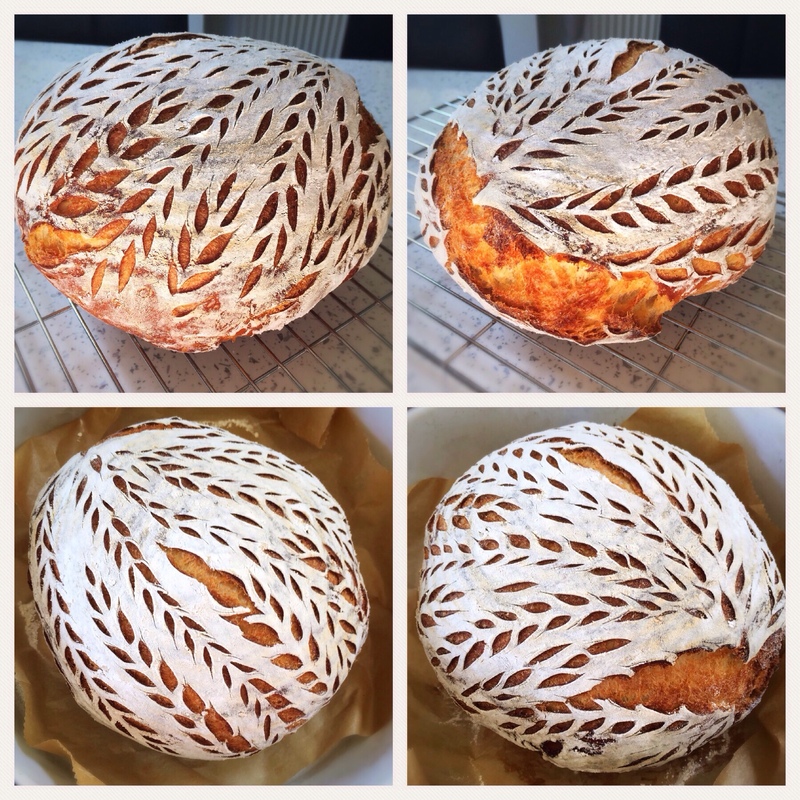 A review of my ‘perfecting your sourdough’ course.. 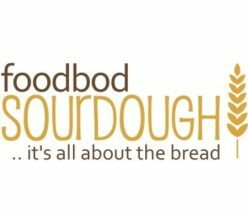 I thought that I ought to write a review of the sourdough course that I did recently with Elaine Foodbod, at her home in Milton Keynes. To put this into context I trained as a chef and have spent 40 years catering, and cooking for the military as well as various members of the Royal Family, as a Private soldier right through to Lt Colonel, but whilst that gives me a head start perhaps, as most of us know, sourdough pretty much breaks every rule I’ve ever known when it comes to yeasted products. 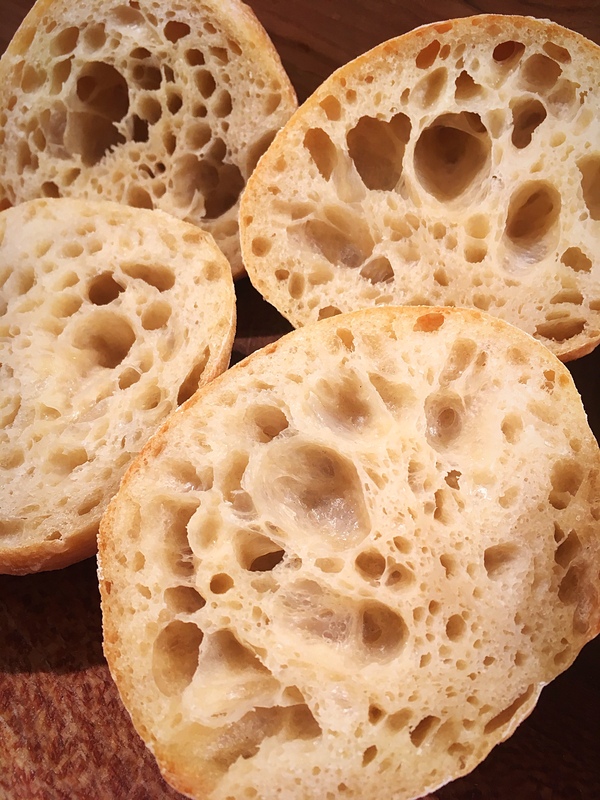 Few other doughs are as ‘wet’ as sourdough, most other doughs require warmth for proving, none that I can think of would you cold prove, nor bake in a cold oven, put in a freezer for 45 mins before baking and most require some sort of vigorous kneading, not the gentle stretch and fold associated with sourdough. Having said that, the day (really just 4-5 hours) was invaluable to me as a learning experience. Up to that point my home starter Herbert had made 20 or 30 loaves with each being a slight improvement on the ones before but I just couldn’t achieve the ‘open structure’ that is associated with sourdough breads. 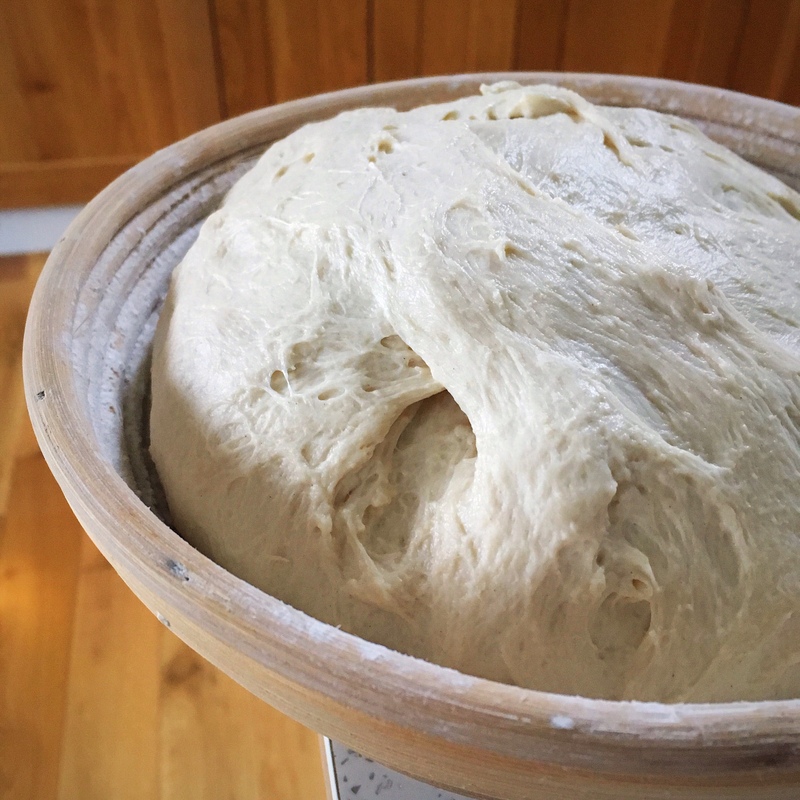 It wasn’t until I’d experienced handling a starter of Elaine’s that felt and looked so different to mine, and a dough that also handled different to mine which Elaine had prepared earlier, (which I was to make myself during the day) was I able to see where my errors were. It really did make so much difference being able to handle it all ‘in the flesh’ as it were. So, an absolute positive for me and that’s before I talk about Elaine herself, her instruction and her hospitality! Elaine is clearly passionate about what she does, she does all in her power to make you feel at ease and comfortable and most importantly of all allows things to progress on the course at your pace, making sure that at each stage of the process you understand what you’re doing and why you are doing it! I couldn’t recommend Elaine’s course highly enough and I look forward to sometime in the future working with her again. 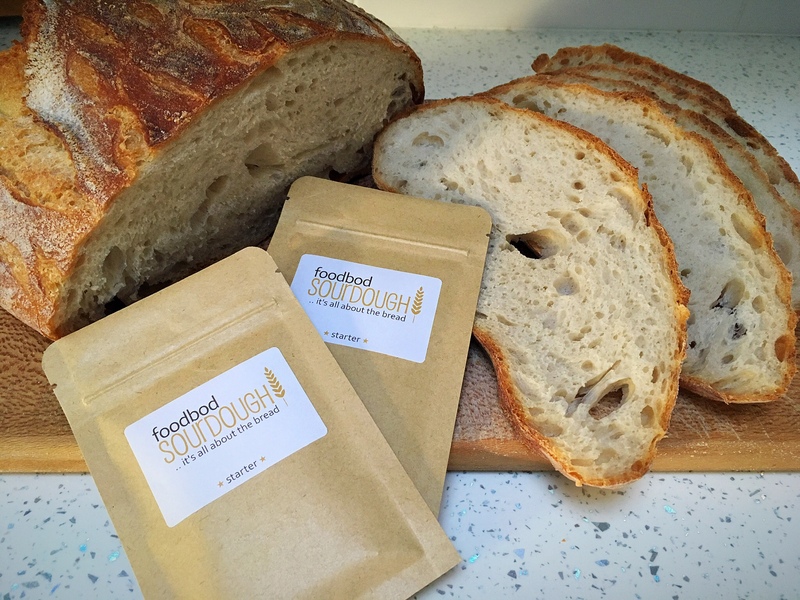 Posted on November 20, 2018 November 20, 2018 Categories sourdoughTags baker, baking, bread, course, dough, goodness, healthy, homemade, making sourdough, prepping dough, pulls and folds, sourdough, sourdough baker, sourdough starter, starter, vegetarian2 Comments on A review of my ‘perfecting your sourdough’ course.. 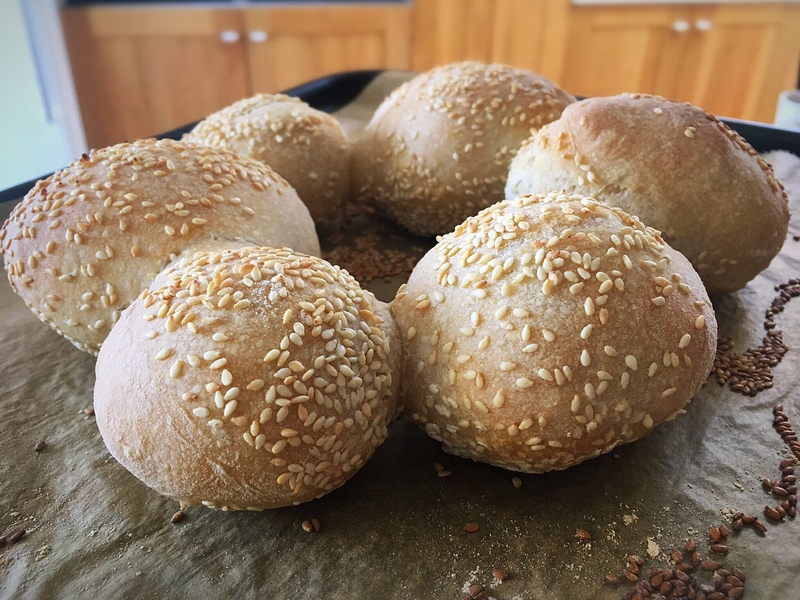 These rolls were made using my master recipe, link to the left, using Shipton Mill finest bakery no.1 white bread flour, but I also think that their Canadian bread flour would work well as it creates a slightly firmer dough in my experience. I also think they’d be lovely with various mixes of flour.. 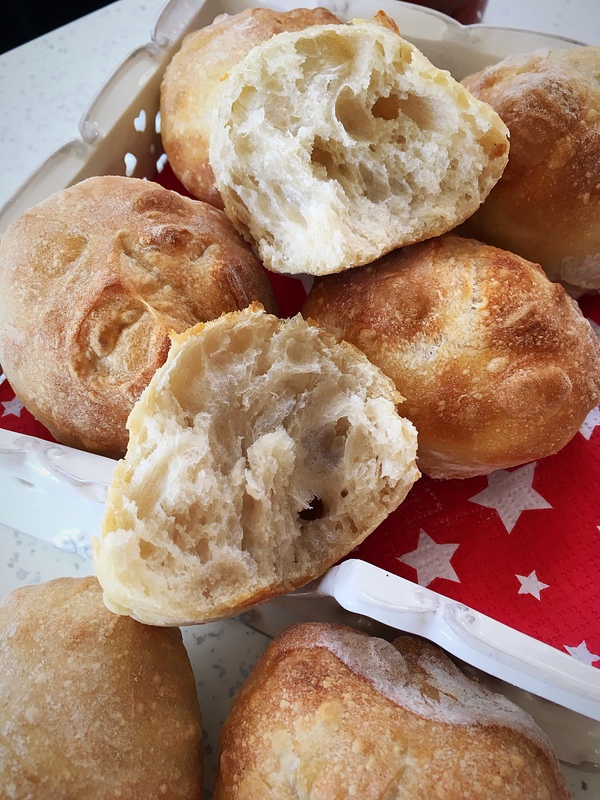 These pieces were rolled gently into rounds with the sides of our hands – very gently, the dough was very light and airy, and we wanted to preserve the bubbles – and placed onto a baking tray lined with parchment paper. As they sat they did spread a little, and grow a little, which is good as it shows that the starter is still active. They were too soft to score so I snipped crossed in the tops with scissors..
We baked them for about 18 minutes, turning the tray around half way through so ensure an even colour across the top. As they baked we watched them grow beautifully, up into lovely balls. They came out lovely and crusty on the outside and soft and holey in the middle. 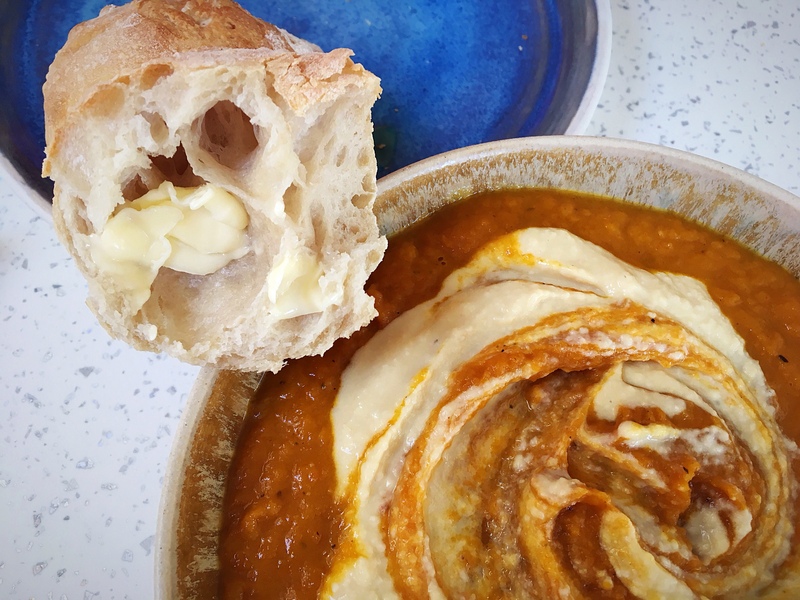 We forced ourselves to let them cool once baked whilst we made some spiced root vegetable soup (I topped my soup with my homemade homous, whilst Steve lashed piles of my homemade harissa on his) to enjoy them with…and it was worth the wait, they were so good! 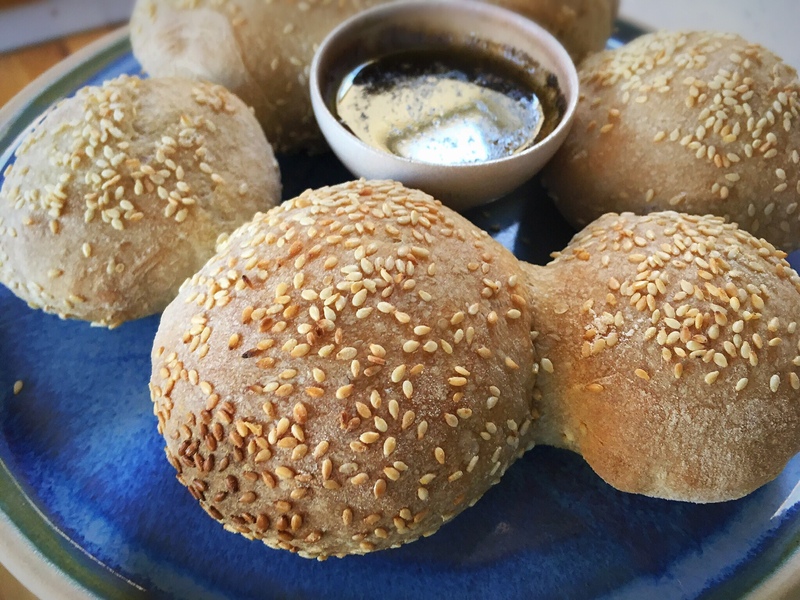 We cut the dough into 16 pieces and made smaller rolls; if you want to make bigger versions, you may need to bake them for a bit longer. Once I put the tray into the oven, I turned the oven on and up to 200C fan assisted, and left them for 25 mins total. Perfectly baked! 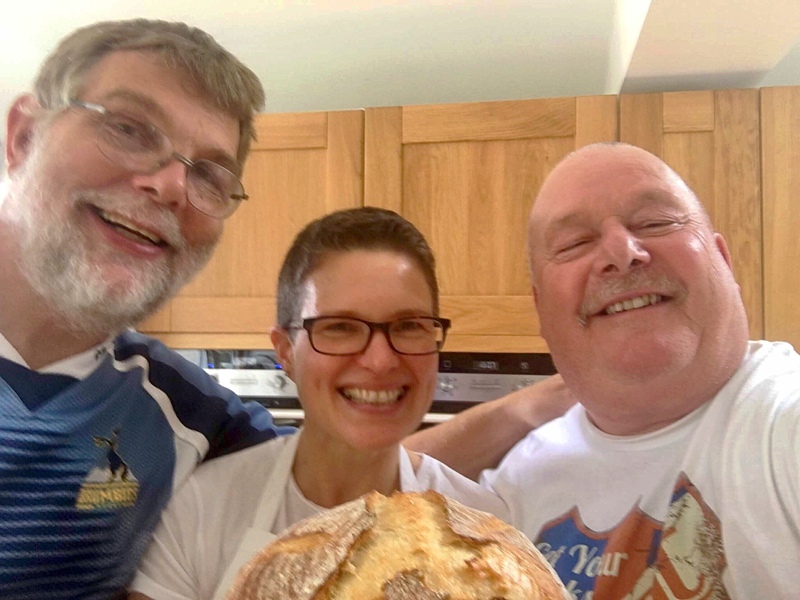 My personal introduction to baking Sourdough bread – Knowledgeable, Enthusiastic and Great Fun. 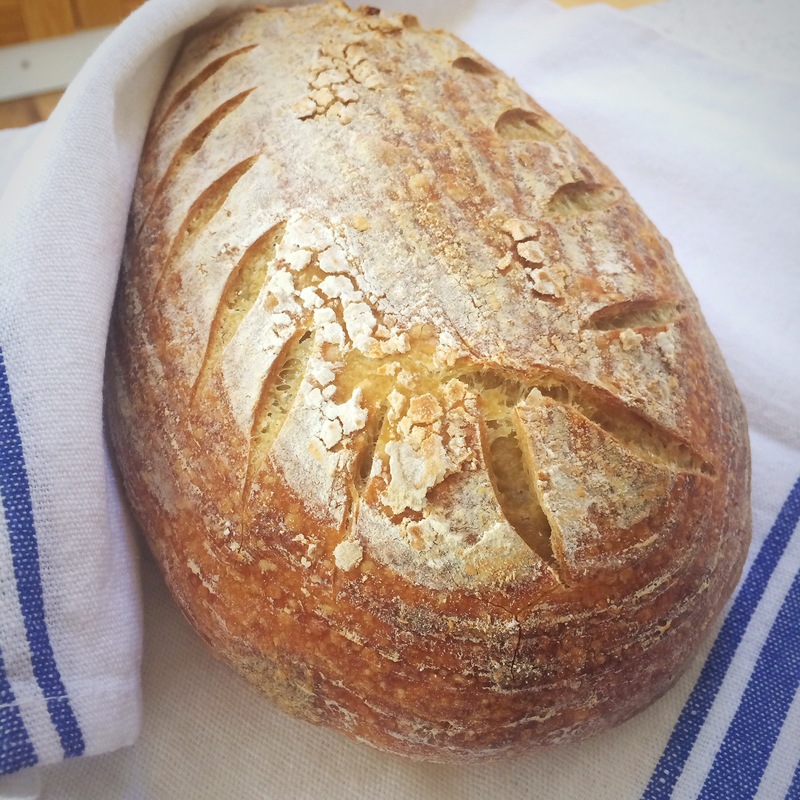 I’ve been a lover of sourdough bread for a while now but the demise of local bakers restricted me to supermarkets. I’ve tried them all with Waitrose being by far the best. But is it real sourdough? 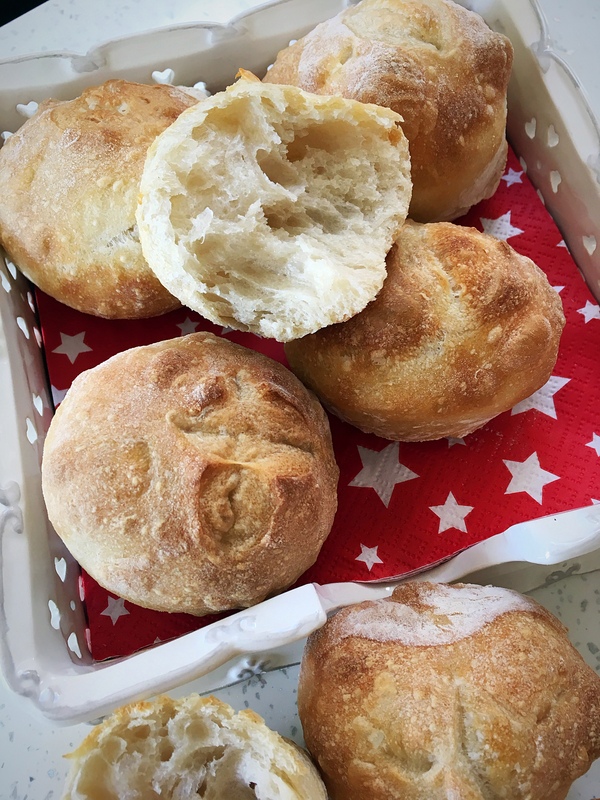 I cook a lot at home and bake bread from tv recipes. But none of them really seem to deliver real sourdough bread. So what’s the answer? 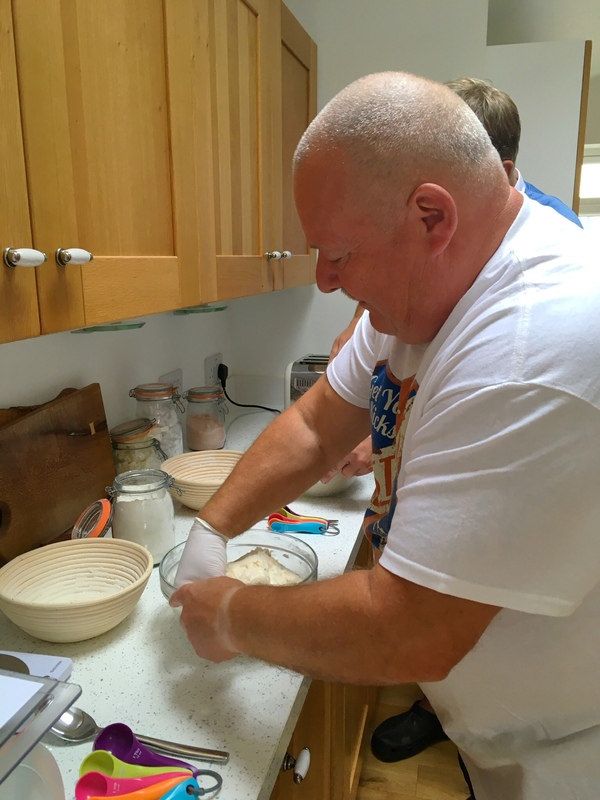 A sourdough baking course, of course. Hmmmmm. Encouraged by my wife who had spotted Elaine on social media, I decided to take the plunge so I booked and went along to Elaine’s course feeling, strange for a retired man, very nervous. Possibly remembering many of the interminably boring management courses I have been forced to attend over the years. 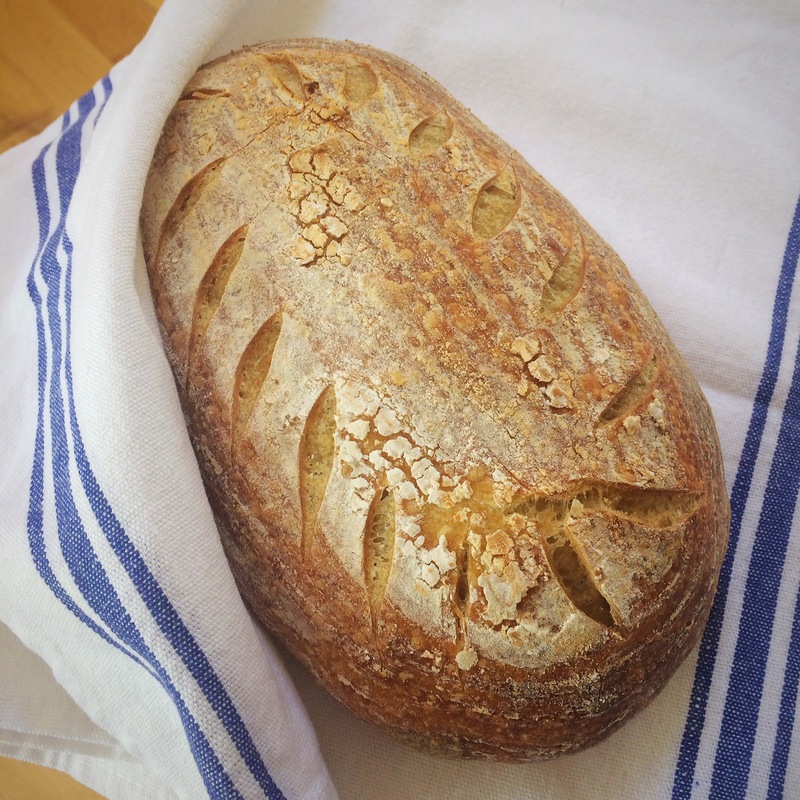 The course was a good half day’s introduction to baking sourdough bread. The great thing is that it was hands on or should that be hands in! Elaine turned out to be a great enthusiastic and patient teacher, putting me at my ease and explaining at a level of detail that was just right for me. The constant supply of tea and sourdough goodies all adds to the experience. I thoroughly enjoyed the teaching, the baking and the chat. Informality was the key to the day and I went home with some superb self cooked sourdough bread and cheese scones plus course notes to help at home. Boring it was not. Elaine clearly explains the methods and the equipment you will need to be a successful home baker. Watching and learning and doing it yourself and learning is key. 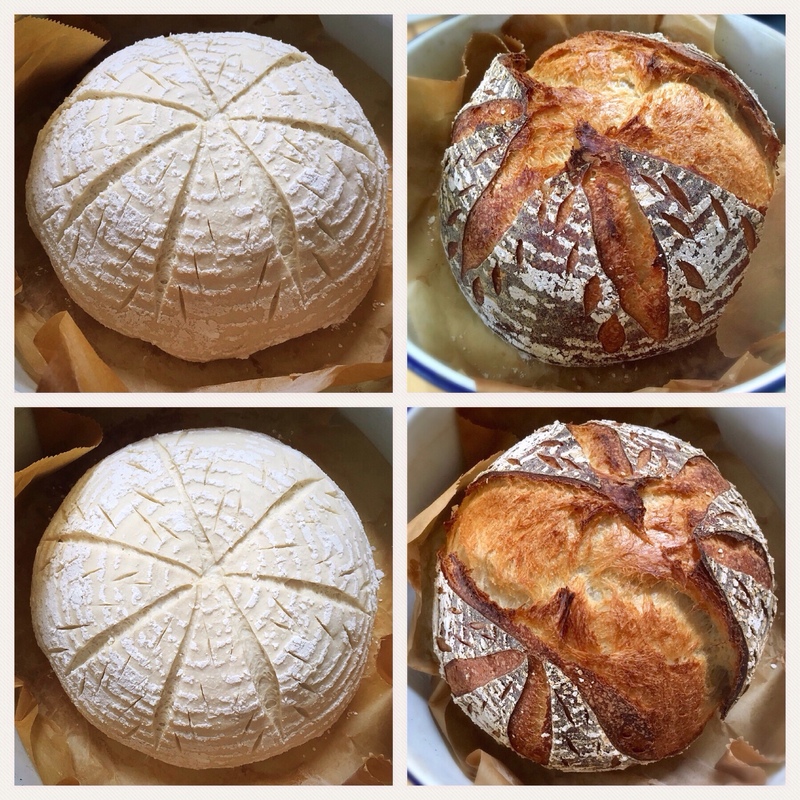 Since the course, I’ve made my own starter and two loaves and things are looking good. I’ve encountered one or two problems or should that be memory lapses since the course but Elaine has been superb with her help, guidance and sympathy. 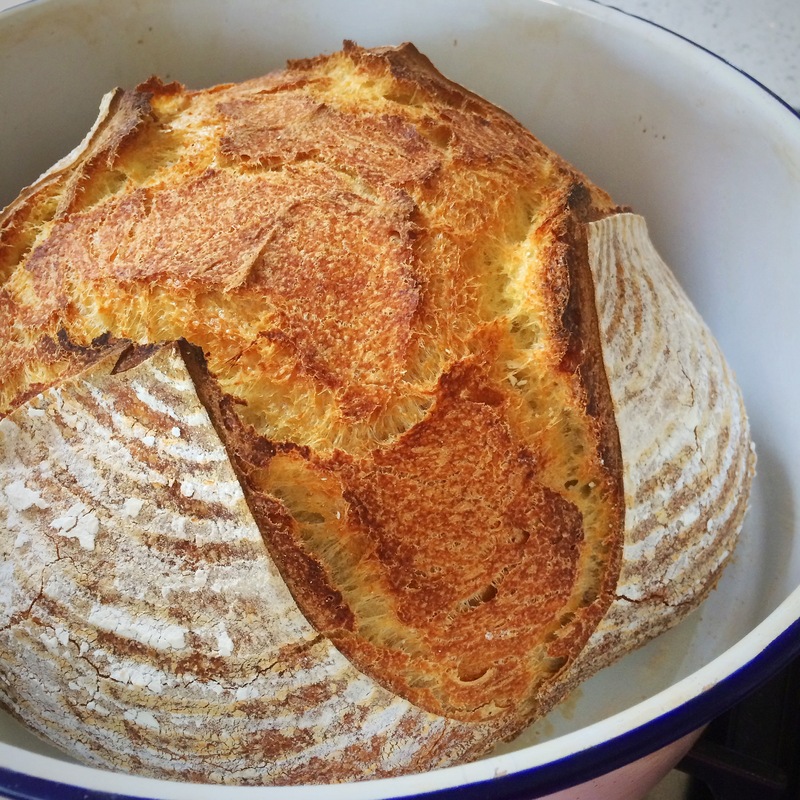 If you love sourdough and want to cook your own, I couldn’t recommend Elaine’s course more highly. Get motivated and try something refreshingly different. 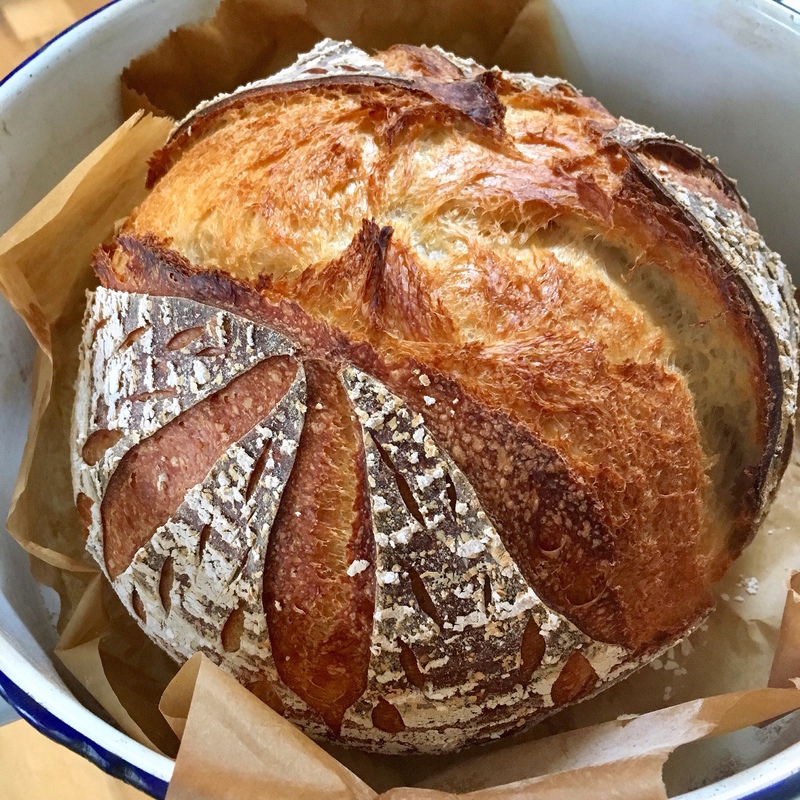 This recipe is inspired by a lovely lady and amazing sourdough baker called Anita (sourdough_mania) that I follow on Instagram; the dough is lovely, beautifully smooth and wonderfully springy, and the baked outcome is really tasty. 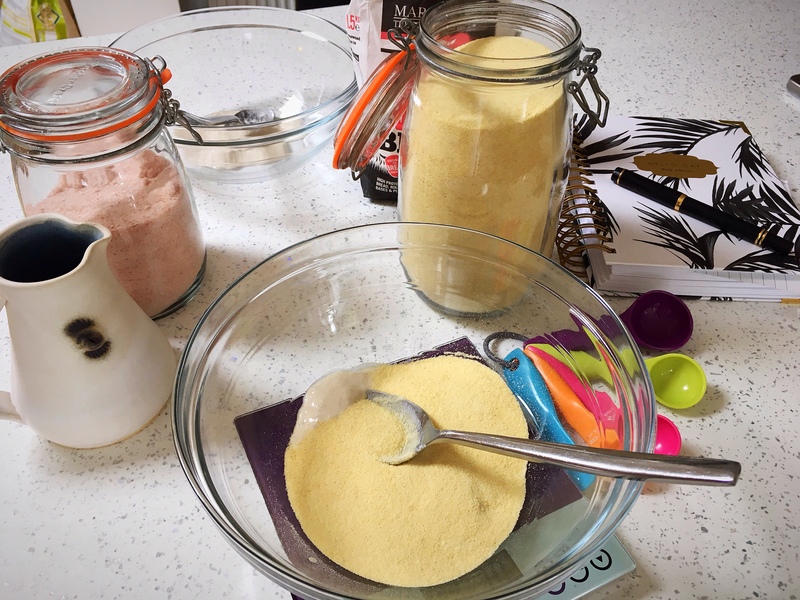 If semolina is just something you remember being offered with school lunches in the UK, this will totally blow those memories away! 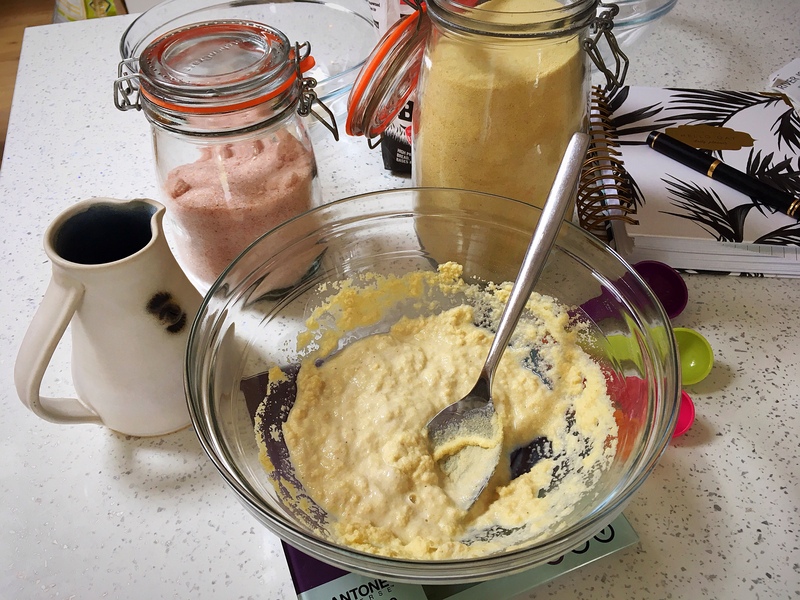 I use coarse ground semolina. This can be found in most supermarkets and any Asian food shop. 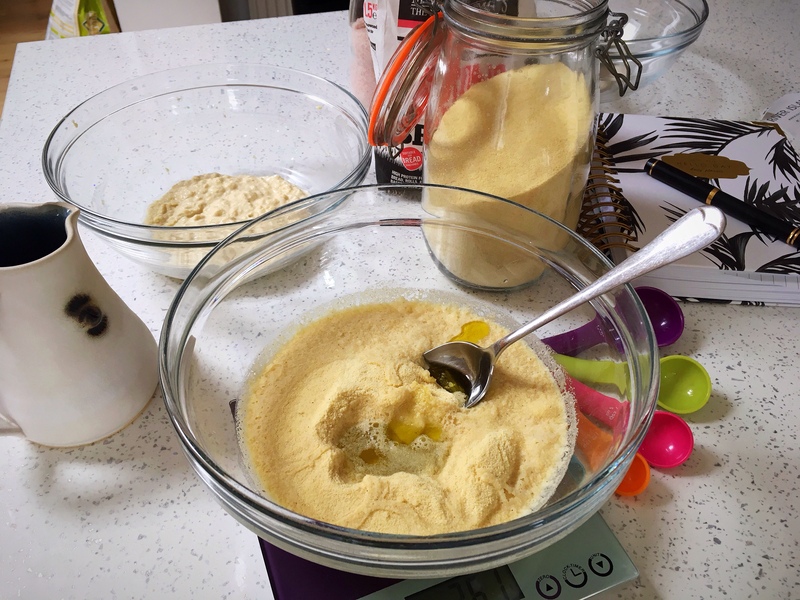 It is also sometimes referred to as semolina flour which tends to be a finer texture, and which will also work in this recipe, but even the supposedly ‘coarse’ one is still pretty fine! NOTE: this recipe is four days in the making, although not labour intensive during that time, and I do think it’s worth it. I tried making a shorter overnight version and the outcome wasn’t as good as the full four day version, although I will be experimenting with that further. All of the love and care does create a lovely, bouncy dough. 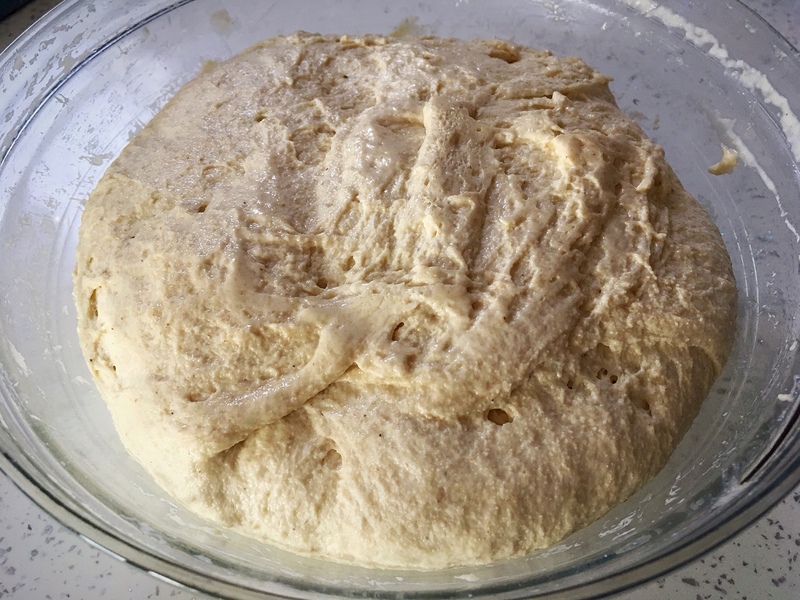 It is a VERY soft dough though and it does need to be cooked straight from the fridge. If you leave it out of the fridge for a while before cooking, my experience is that it will lose its form and spread as you bake it. Feed your starter. I know that if I feed Star with 40g of strong white bread flour & 40g of water, she will yield the necessary 70g of bubbly starter. 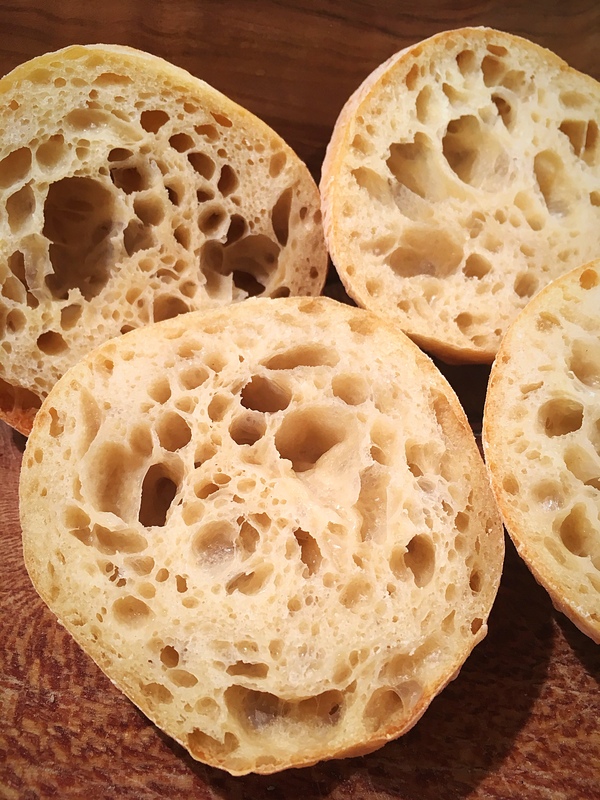 Once your starter is lovely and bubbly, begin..
…and leave in fridge overnight. Day two: remove the semolina/water/oil mixture from the fridge to soften up and make it easier to mix with the starter. 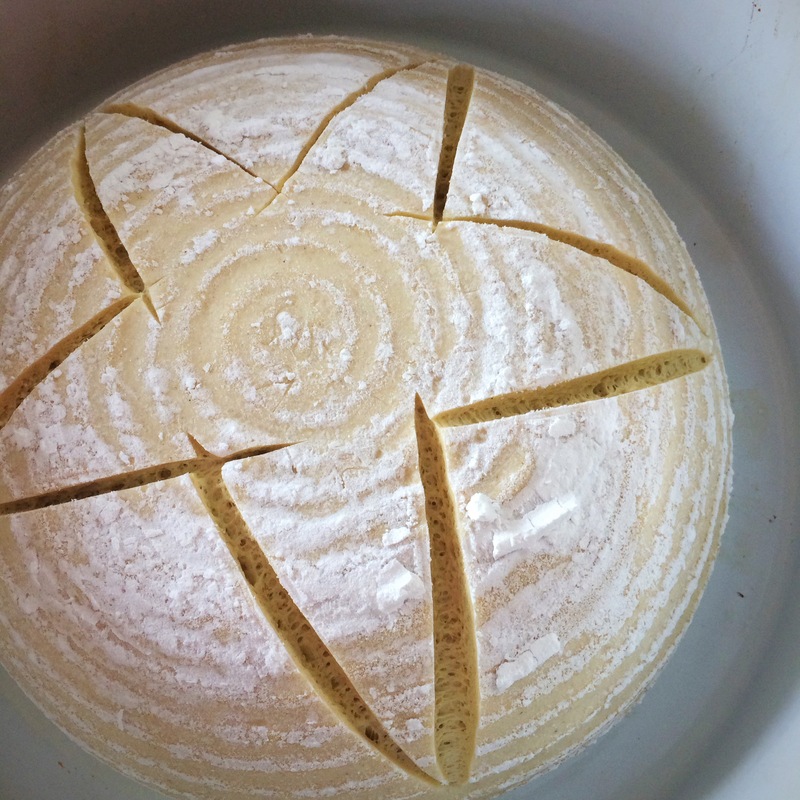 Your starter should be lovely and bubbly and alive now. Add 1tsp salt to it, then mix it into the semolina/water/oil mixture. You’ll need to get your hands in to mix it really well. 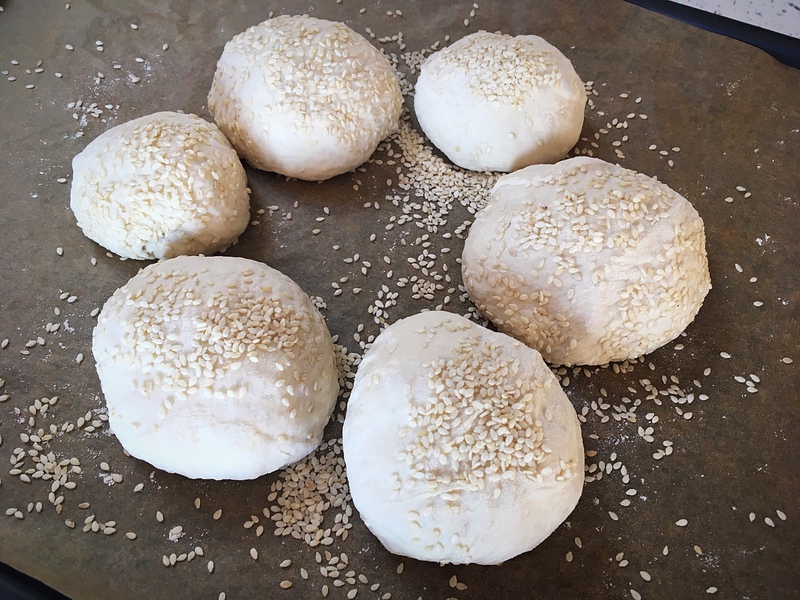 Keep it out of the fridge like this for 2-3 hours and during that time, perform a series of 5 stretches and folds on the dough, each set only needs to be a few pulls and folds to pull the dough together. Then cover the bowl and return it to the fridge. Day three: remove the bowl from the fridge and leave at room temperature and allow the dough to increase by about 60% (by eye). 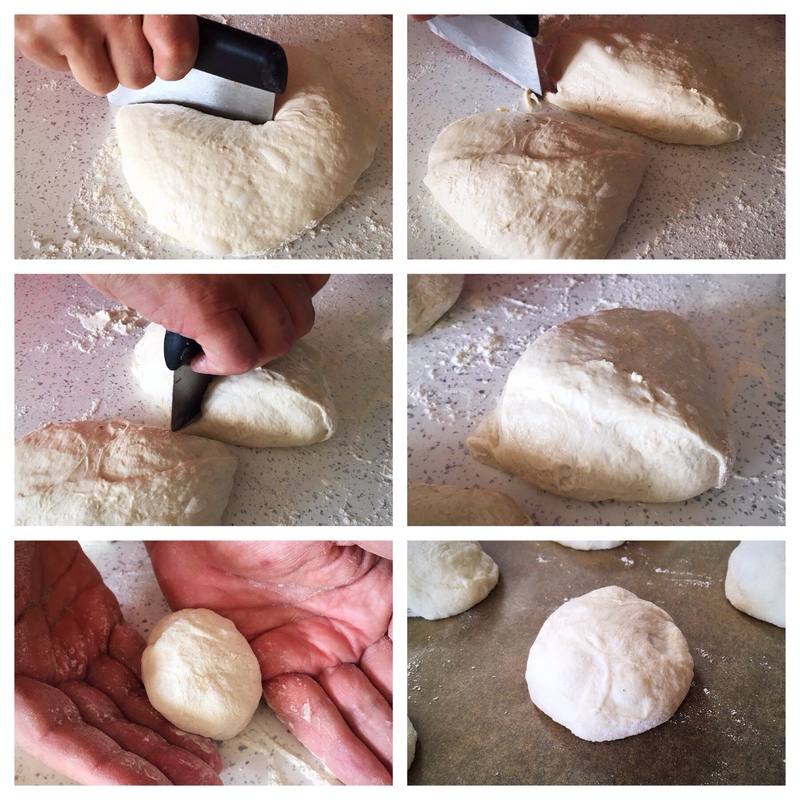 Then shape the dough. 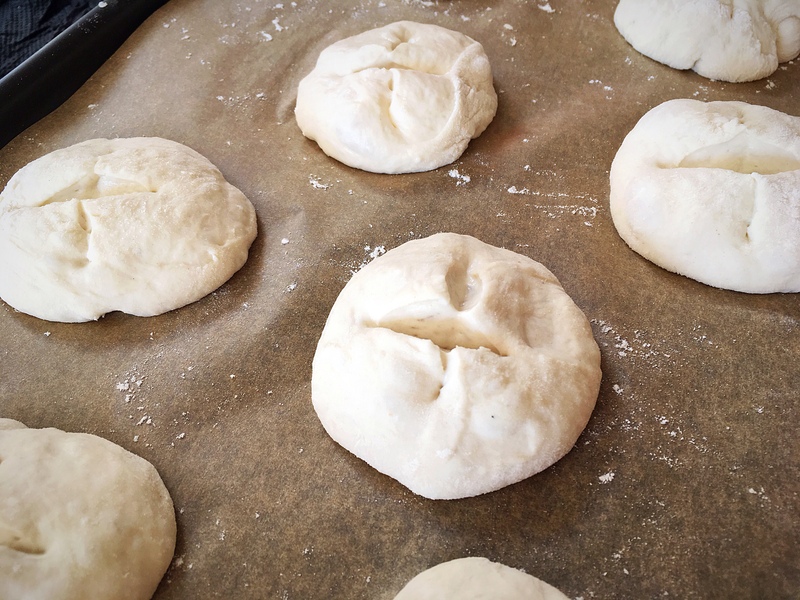 I stretch and fold the dough into a ball and place it into a floured banneton. Cover and put back into the fridge. Day four: Preheat oven to 275C. 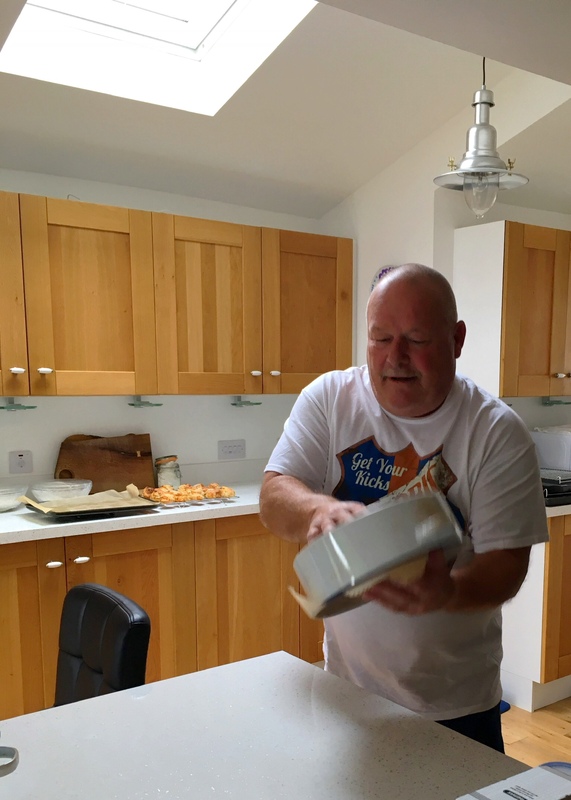 Prepare your choice of bakeware – I bake mine in an enamel roaster on a round of parchment paper. Take the dough from the fridge and place directly into the roaster/on baking sheet, slash and put into the oven. 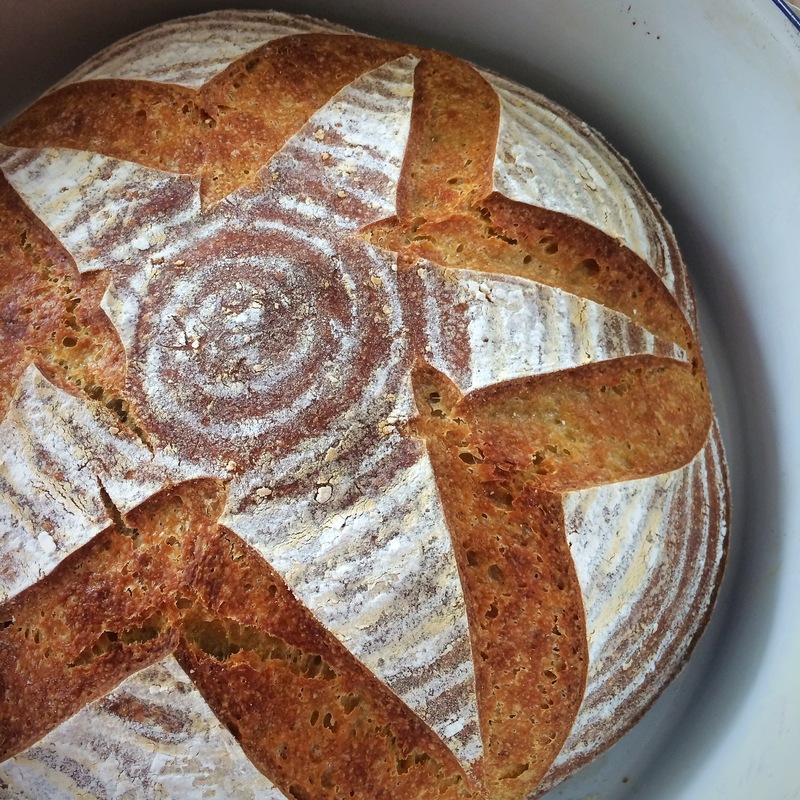 Having made this again twice recently, I found that my loaf started to brown very quickly when I removed the lid, so I ended up putting it back on. Can I suggest baking the loaf with the lid on for the entire 40 mins? If you want to brown it slightly, take the lid off for the last 5 minutes only. 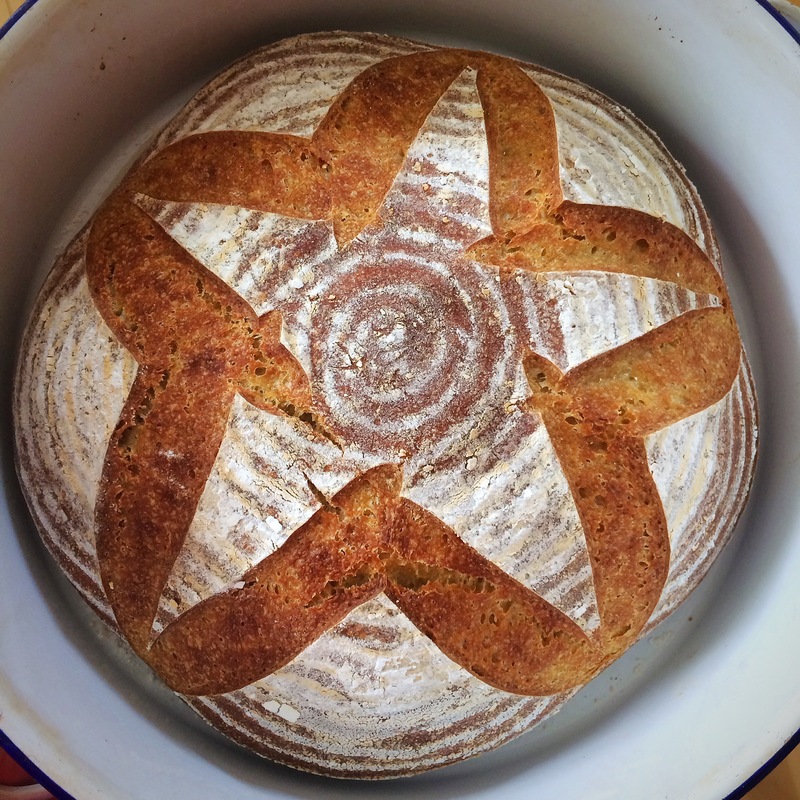 Since making this first loaf, I went on to make 3 more in quick succession. For one of them I merely doubled everything and created a monster loaf (above)! 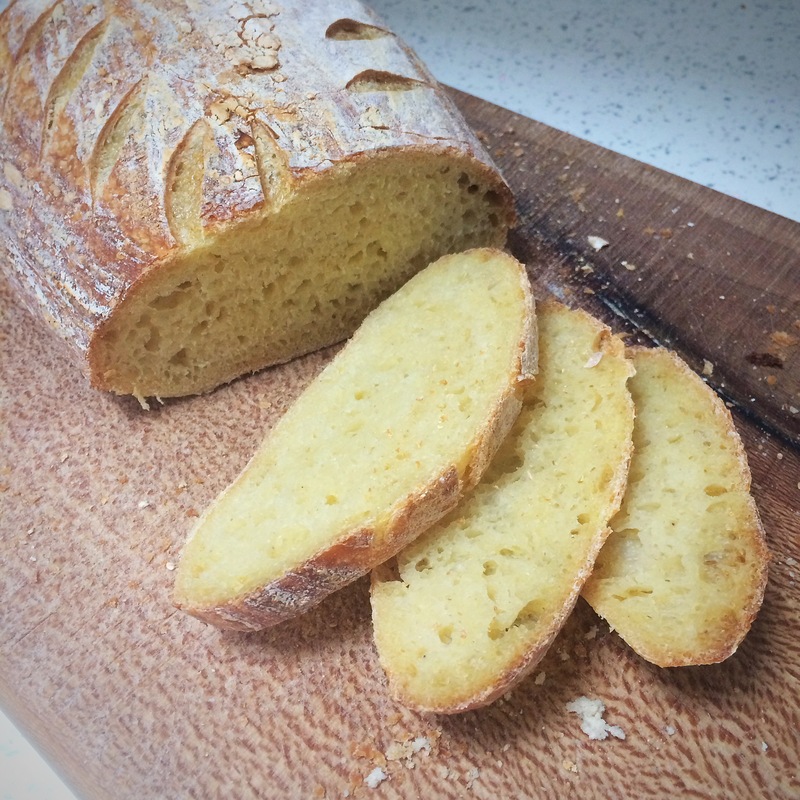 It was a beauty though… I’ve also calculated up the quantities to make a 500g (semolina) loaf which is my typical size, and it worked well too. I highly recommend giving it a go! This loaf came about from pure experiment because I had some lovely lively starter and wanted to do something different with it, plus I have always got various cartons of buttermilk to hand nowadays, and so this idea was born. 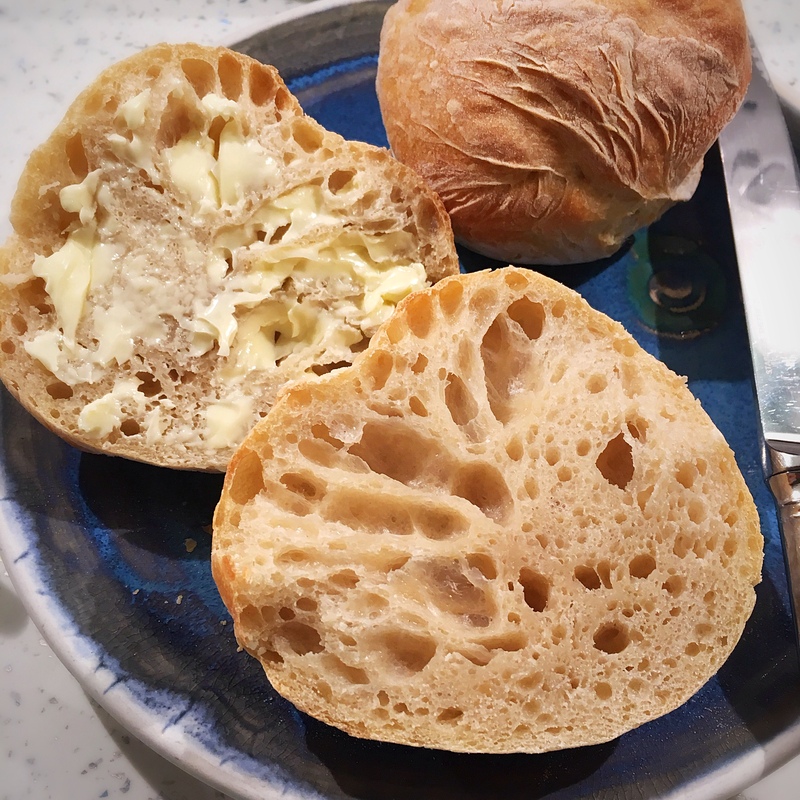 This recipe produced a lovely silky dough which baked into a crusty loaf with a wonderfully soft interior and a great flavour, and the smell was amazing! 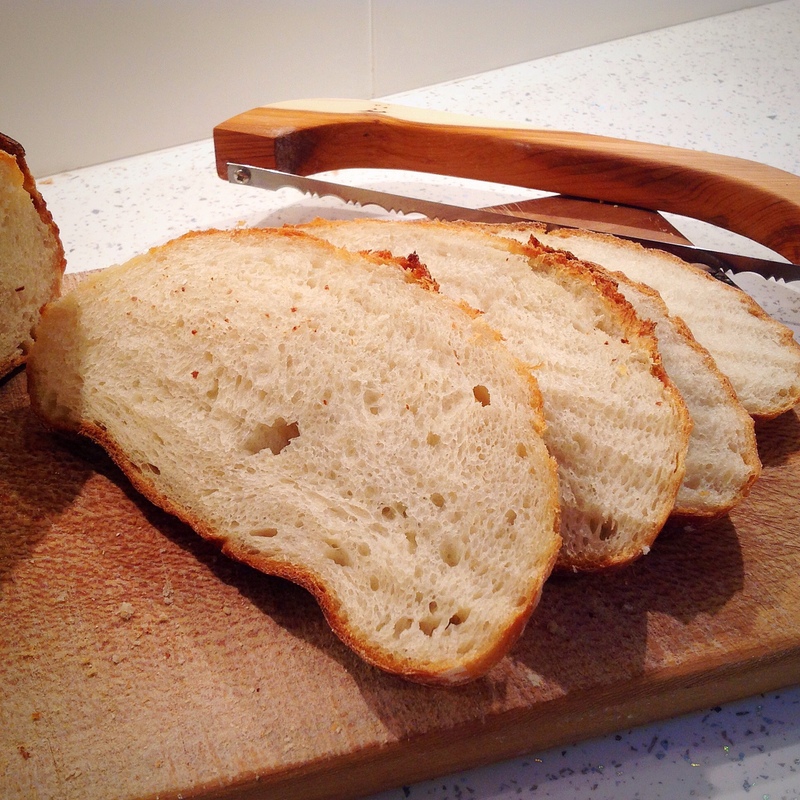 Due to the inclusion of plain all purpose flour the crumb is pillow soft rather than the usual chewy sourdough crumb, and the buttermilk only adds to that. Cover and leave on the counter again. 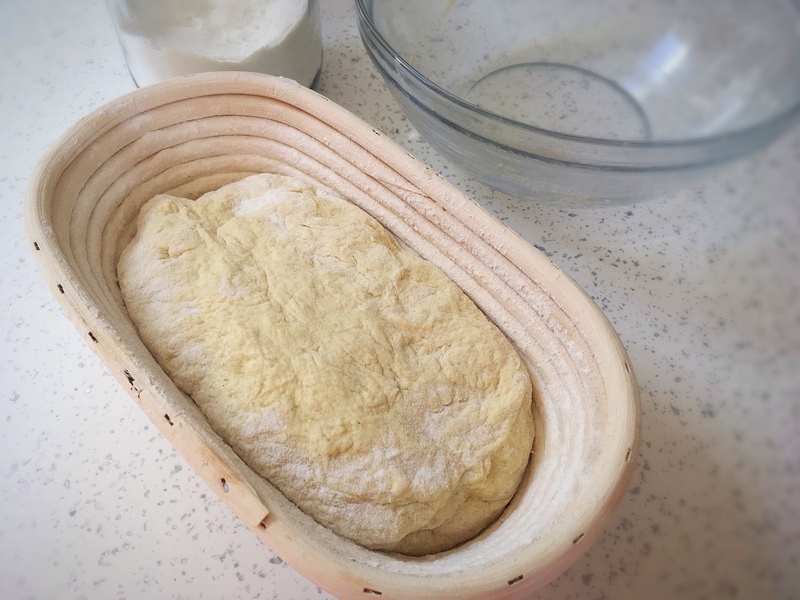 After a couple of hours you should already see this dough growing happily, the dough may even be starting to grow out of the bowl already; perform just enough pulls and folds to pull it into a ball with a smooth finish, don’t handle it too much. Place the dough, smooth side down, into a well floured banneton. 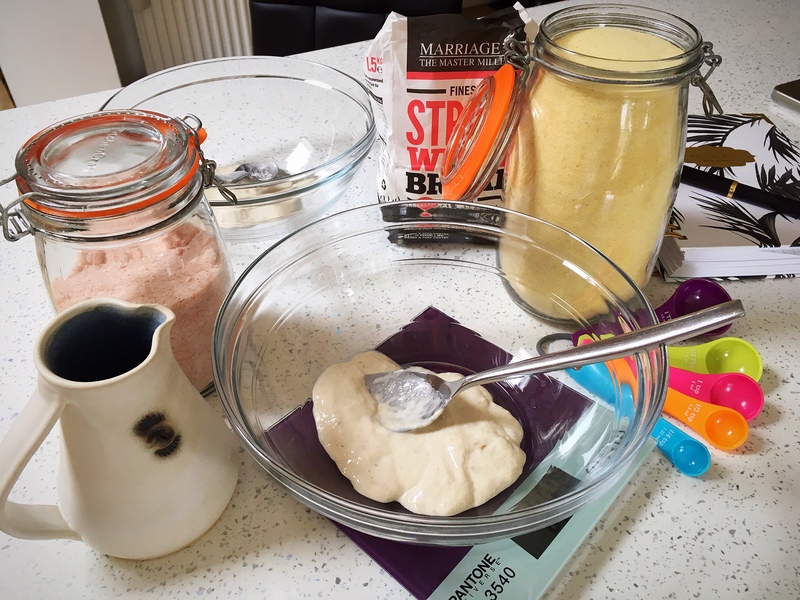 Cover with a plastic bag or shower cap and place in the fridge to slow down the proving process and to increase the flavour. You should find that it keeps growing nicely over the next few hours, even in the fridge, as below. 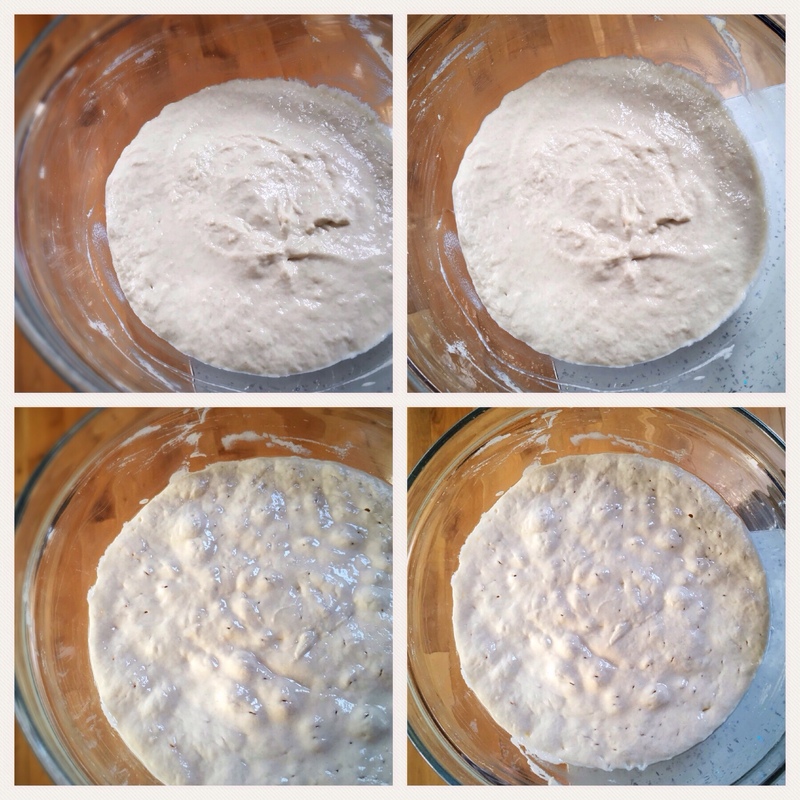 This was how the dough looked after only a few hours in the fridge. It grows very fast! When you’re ready to bake, take the banneton from the fridge and leave the dough to warm up to room temperature whilst your oven warms up. Heat the oven to 200C fan/230c non fan. 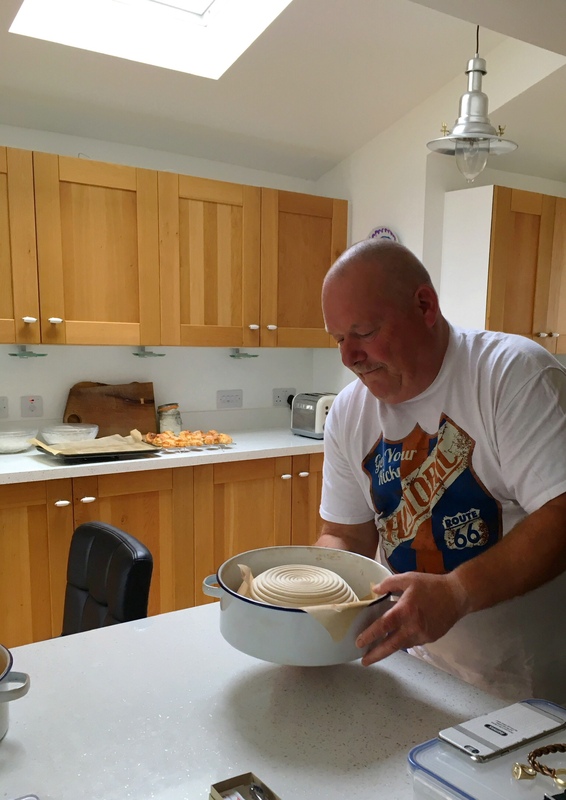 When the oven is ready, place a piece of baking parchment over the top of the banneton, then place the pan you are baking it in over the top and invert it all together to turn the dough out into the pan. You should have a lovely pale dough that holds a good shape. Slash as you like, then put the lid on the pan and put it in the oven to bake for 50 minutes. After 50 minutes carefully turn the loaf out onto a rack to cool. Allow the loaf to cool for at least an hour before slicing. As you will see, the crumb is closer than a standard sourdough, which is perfect for making my son’s school sandwiches. 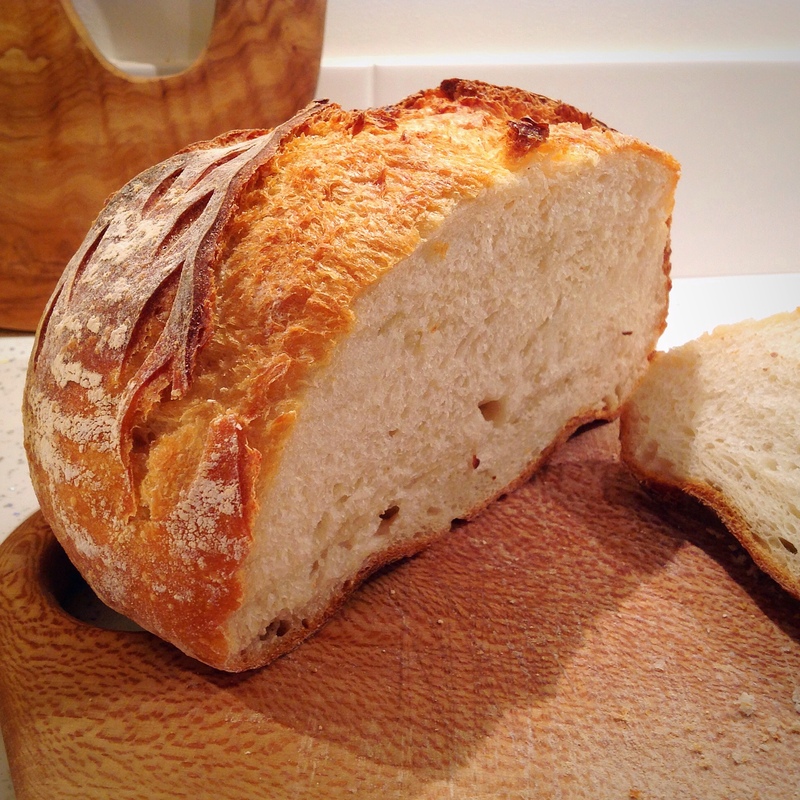 In fact, the interior of the loaf was softer than any bread of any type I’ve ever baked. 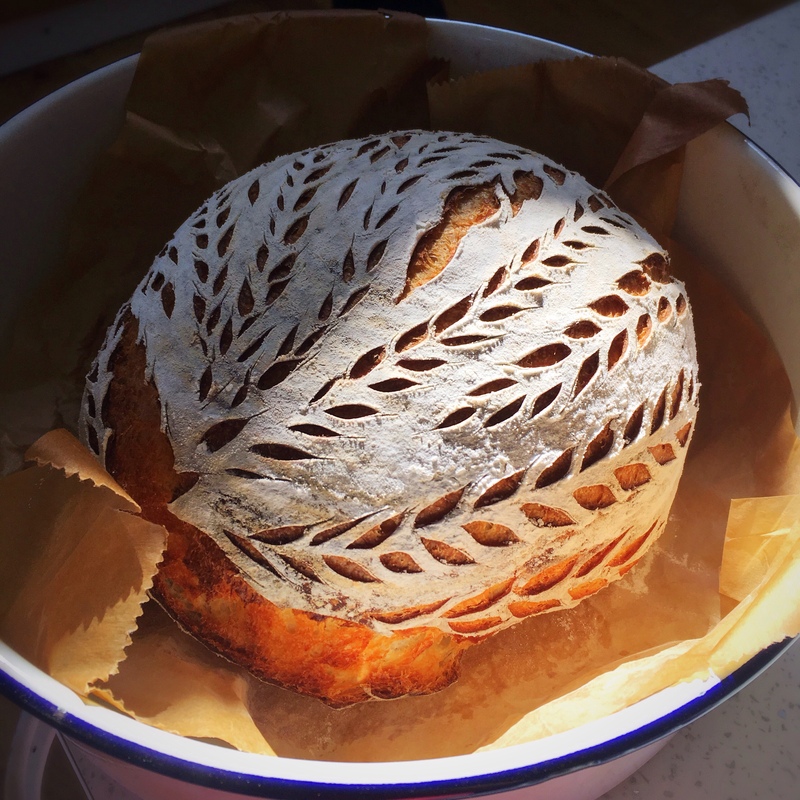 I’ll definitely be baking loaves like this again and again. 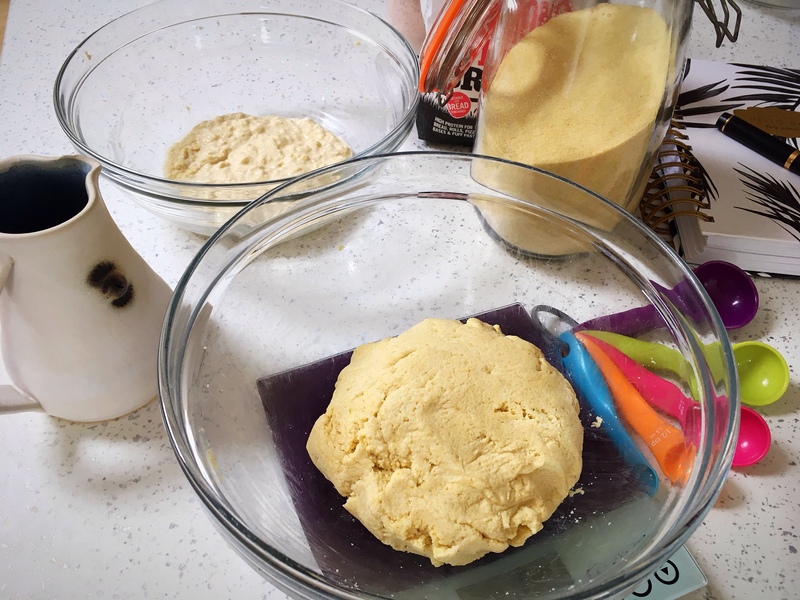 NOTE: please always keep in mind that flours differ around the world, yours may need more or less liquid than mine, just as your oven may behave differently from mine.